In my district we are well aware of our demographics. How we mostly teach one demographic students, and while these students span an enormous socioeconomic range, they look a lot like each other. How sometimes our world can seem protected with only the biggest stories slipping through. I also teach 7th grade where the rest of the world tends to slip away as the students are focused on their own social development and their own place in the world, rather than the world that surrounds them. Yet, we try. We constantly try to engage the students in projects that will bring the rest of the world in, start conversations, and ultimately lead to change. When AJ Juliani first posted about the 2030 UN Challenge I didn’t much notice it. He has a lot of great ideas but this one slipped by until my awesome colleague , Reidun Bures, brought it up to me again. We decided that this was the perfect opportunity to collaborate between our classes, but more importantly to simply make our students more aware of the major challenges that faces our world. So for the past 3 weeks, we have combined classes and worked on the 2030 UN Challenge. 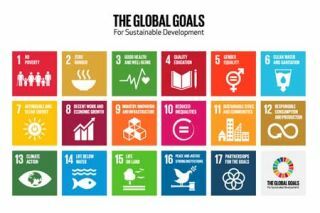 Students watched the video listing the 17 goals that the UN has set for the next 15 years (it came out in 2015) and then decided which goal they would focus their project on.